It irritates me greatly when News Channels and Newspapers seize upon ground-breaking studies that will purportedly change our lives, possibly ‘lengthen’ or maybe even save or our lives? Like the New York University study deducing pedestrians crossing on 42nd street that did not look both ways stand a 50% higher chance over being run over and killed than those that did. Before you Google this, I made it up. Still, it’s probably more profound and accurate, even life saving, than what Harvard School of Public Health just came out with recently. These sorts of studies invariably read like an economists global financial forecast reports, about as clear as mud and invoking more unanswered questions and vagaries amounting to total meaningless half-truths if not bamboozling misinformation. Having read through the HSPH report, I am a little curious why the ratio of woman in the study is almost three times that of men, 83,644 women to 37,698 men. It’s a wonder there’s not been a complaint on sexiest grounds already. We know women purportedly live longer than men but surely it is a democratic right to be judged on our deathbed equally and without such gender bias. I am sure there is something in the American Constitution on this. Speaking of American, are we to assume that the genesis of Homo-Sapiens is indeed America, as in our bodily make-up, our DNA, our habitat, our primal receptors and hunting and gathering techniques, all evolved out of Manhattan. And as the human race evolved throughout the world, beyond America, we assume from this study and its conclusive outcome on all carnivores on this planet, that we are all essentially American. Just on the hunting, gathering and eating techniques and emphasising the vital point in the report “clear evidence that regular consumption of red meat, especially processed meat”, I would suggest the amount of processed meat American’s eat is exponentially higher than anywhere else in the world, and hey, there just might be the link to eating chemical crap and falling off the perch early. As these finding are based on the American carnivore, I thought it appropriate to reference largely American resources on the subject, and a pertinent reference from Anthony Bourdain’s recent book, Medium Raw, (HarperCollins ISBN 978-0-06-200903-6), an entertaining read although I should warn you, written with a certain vernacular of expletives and a gritty bluntness. The point is, if you new what went into commercially produced hamburger patties, sausages, hot dogs, spam etc (processed meat) you would never eat it again. And if our learned colleagues at HSPH wanted to get to the crux of the matter, and actually help lengthen or even save lives, they should spend more time on detailing the facts of food adulteration and that eating chemical crap will most surely shorten your lifespan. Watching the recent CNN coverage of the President of the United States, Barrack Obama, cooking hamburgers on the front lawn of the Whitehouse for the British Prime Minister, David Cameron is a powerful illustration of how symbolic this American tradition (hamburgers) is. However, if one is to believe the HSPH findings is the American President unwittingly participating in involuntary manslaughter? I assume President Obama is like my good (American) friend in Singapore who loves his hamburgers and invites us around all the time to eat them; that is he makes his own. A mandatory trip to the best butcher in town (Singapore), Huber’s, he instructs them to carve off a piece of Margaret River, West Australian free range, grass-fed, organic Wagyu rump—not only a relatively leaner Wagyu cow but a cut that is proportionately lower in marbling than the rest of the animal,a nd has them mince it up with nothing else added. I know your thinking Wagyu is Kobe-style beef with an incredibly high content of fat marbling, however being grass-fed is a strategic point which I will go into further shortly, but this rump has the ideal balance of fat-meat ratio required for a good burger. And I have to say, our friends burger cannot be improved. Let’s just assume, if there were some basis to red meat consumption shortening your lifespan, shouldn’t we be seeing unprecedented mortality rates in Argentina and surely New Zealanders should be placed on the endangered species list? Shouldn’t we be warning them not eat all that grass-eating lamb, beef and venison (deer) and goat. At this juncture, a little fat 101 is pertinent; specifically we humans need essential fatty acids (EFAs); alpha-linolenic acid (an omega-3 fatty acid) and linoleic (an omega-6 fatty acid), which are essential to our biological processes and good health, and as our body cannot produce EFAs, we have to induce them. We know that the balance between omega-3 and omega-6 is an issue, and that we should have a lot more of the omega-3, which is what our people at Harvard are banging on about moreover, apparently omega-3 makes you happy, which we definitely need more off. We also know omega-3 is commonly found in marine and plant oils, and if we mammals must eat EFAs then it makes sense to include more of these in our diet. However, what the nutritionists are not saying loudly enough is omega-3 is also present in red meat, but more importantly higher in GRASS-FED meats, “the n−6 to n−3 ratio of grass-fed beef is about 2:1, making it a more useful source of n−3 than grain-fed beef, which usually has a ratio of 4:1”. If I could interject at this juncture, a friend of mine in Southeast Gippsland, in Victoria, Australia (or in the colloquial vernacular, in the middle of bloody nowhere) has a property called Moondarra, www.moondarra.com.au where he raises Wagyu cows, more specifically, Tajima cows, from Hyogo prefecture, where Kobe beef is produced. The original plan was to sell beef into restaurants differentiated by variety and region, appealing to chefs and a growing awareness of consumers identifying with regional produce. After many years of successfully selling Moondarra 500 day Grain-Fed Wagyu which was heavily marbled and perfectly tender and moist, they came to the realisation that the muscle itself had little flavour and there was no Gout du Terroir – no discernable regionalism about the flavour. Prentice also discovered his Tajima Beef had ‘melt in your mouth’ fatty acids (Oleic and Stearic acid) identical to the Jamon, or Iberico Pigs, treasured for their dried meat and small-goods and has been experimenting with “Sobrasada” style sausages and air-dried salami. Yes, shock, horror, processed meat – but we will talk more of this shortly. 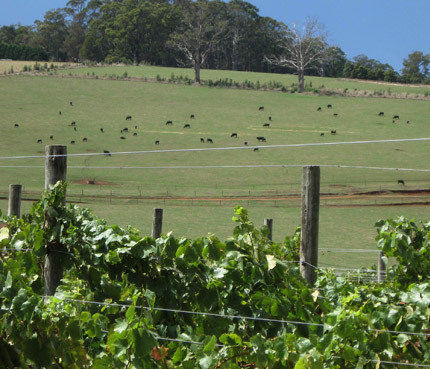 Moondarra is just one of thousands of examples around the world where cows raised naturally on grass not only manifest where they are from but also what they eat. And provenance is everything if you want to authenticate what you are eating. But, here’s the crazy, perplexing reality, most (American) consumers think that (corn) grain-fed beef is superior to grass-fed, unscrupulously promoted by butchers, supermarkets and even steakhouses worshipping that USDA Prime Cut—all because it has a whole lot more fat—that tastes good. Yessiree, the whole grading system works on marbling, the higher the fat, the higher the quality of the meat. 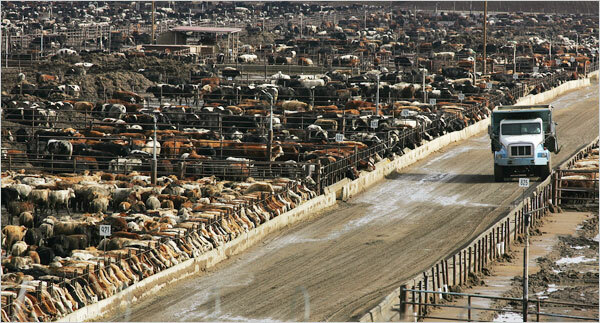 Here’s another irony, a cows digestive system cannot cope with a diet of corn and grains; it’s unnatural for them and causes major health problems, which is why they need to be feed a whole lot of antibiotics to keep them alive, just long enough to survive a feedlot, or Concentrated Animal Feeding Operation (CAFO), as they officially known. These so-called USDA Prime cows stand in dirt and their own manure for months on end in crowded pens, feed on a concoction of corn, antibiotics growth hormones and steroids, and the all the unmentionables like chicken manure and food wastes, and not that long ago (in the time frame of our HSPH Study), slaughterhouse waste and even dead pets, all ground up and ammonia bleached, because we are a little worried about E. coli contamination! Just the corn alone is a huge worry, invariably full of synthetic fertilisers, pesticides and herbicides. If you consider that the large majority of beef in USA is CAFO grain-fed, any wonder there’s an increase in “cardiovascular, and cancer mortality” as per our HSPH Study. So, is meat actually bad for, or is it actually bad meat is very bad for you. Folks, here is a book that covers it all and is a must-read if you want to extend your life—and your families. 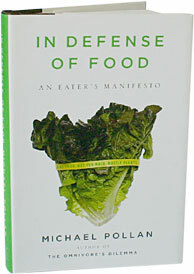 In fact, if the incumbent President really wants Obama-Care to work, he should send a copy of this book to every single American, and even if only 20% of the US population adopt Pollan’s approach to eating, the savings in medical costs alone would pay for the entire National Health Program. Actually, if President Obama took a tiny sliver of the US Defence Budget and that 1 trillion dollar war cost and redirected to sending a copy of ‘In Defence of Food’ to everyone on this planet, he might just truly save the world. There is so much philosophical prose, thorough research and balanced journalism, logical theory and summation in this book I’ll go vegetarian if this does not inspire change in your diet or at the least, the way you think about food, and want to start enjoying food. The inside jacket cover introduction is powerfully succinct and having read the book several times, the solution is almost ridiculously logical; it just makes sense and if we simply spent a little more time and thought on what we eat, like our grandmothers and great-grandmothers did, we would not be as prone to our modern days diseases and ailments. Of processed meat, the most abused, maligned and greatest source of misinformation in any produce or food production; timeless, traditional, cultural practices and methods like sausages and salami, high jacked by industrial food companies churning out cheap, nutrition-less stomach-fill that have more synthetic additives than the humble neglected bits or discarded cuts that have shaped diets and cuisines for centuries around the world. The problem is exacerbated by the very (incorrect) word ‘processed’, whereas is the correct terminology and technique is ‘preserve’ or the methods of preserving meat, not only a staple but essentially life-saving facet of the Mediterranean diet; that miraculous and uber-healthy diet the modern western world’s is pinning its hopes on digestive immortality. All those wonderfully fatty delicatessen foods that seemed to be obscured in the fish-eating, pseudo-vegetarian Mediterranean diet where born out of necessity, that the majority of people could not afford to eat lamb, goat or cattle ‘meat’ and made best of every part of the animal that the rich did not want—to eat, which has not changed much to this very day. This is where I have to depart from American reference and quote an extraordinary Englishman, although the latest reprint of his book does have an introduction from an American, the intrepid Anthony Bourdain and clearly bait for the American market. 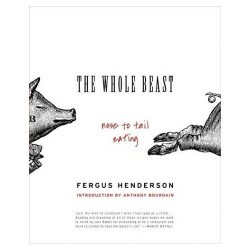 Anyway, after you have read Michael Pollan’s ‘In Defense of Food’ you MUST get your hands on a copy of “The Whole Beast, nose to tail eating’ by Fergus Henderson. There might well be validity in the HSPH study, that “Volunteers in the meat study who reported eating the most processed red meat, such as bacon, salami, hot dogs, and sausages, had a higher risk of dying from cancer and heart disease than those who ate mainly steak or meatballs.” However, anyone who buys commercially processed meats clearly wants to die earlier and that’s a democratic choice. Frankly, people have the wrong end of the sausage here and personally, there is no other meat I enjoy eating more than pig bits and sausages, salami, air-cured meats, andouillette and offal dishes, moreover a meal at Fergus Henderson’s St John Restaurant in London is remains one of the most memorable dining experiences I have ever had. As far as the HSPH studies core finding, “That those who ate more than two three-ounce servings per day —had about a 30 percent greater likelihood of dying over the course of the study compared with those who ate about one to two servings per week”. Frankly, anyone that eats red meat five days in row is going to die of culinary boredom and will be gastronomically brain-dead long before cancer or anything else gets them. At the end of the day, what we eat is going to be personal choice, and as Pollan puts it, we have never really needed experts to tell us what to eat. I try to impart this sense of self guidance already on my 8 year-old daughter. I said, well it’s the only thing remotely connected to what might have been corn, the rest are chemicals, artificial flavourings and colourings”. She put them back on the shelf. We now have a mutual pact that if you can’t pronounce what’s on labelled ingredients or know what they are, we don’t eat it. I didn’t have the heart to tell her practically everything has refined corn starch and chemical additives these days moreover, and with all the industrialized, refined foods dominating our supermarket shelves, the best advice I could give her is not to eat at all. I don’t know about humans and their ability to evolve; I’m still trying to work them out. Like the other day, a woman at the supermarket checkout lets the cashier pack her purchases in plastic bags, and then proceeds to place them in a reusable bag made from recycle material with the words “Say no to plastic bags” emblazoned on it. Figure that one out. It’s a good thing the President of the United States understands the qualities of free-range grass-fed meat, serving up Bison Wellington at the recent Obama-Cameron State Dinner, not only a diplomatic courtesy and nod to the 1st Duke of Wellington, but a very generous boost of omega-3 to all the honorable guests, including Republicans. This is of course not just an American issue. The “Industrialization of Eating” is as prevalent in Europe and around the western world as it is in America. What is perhaps more worrying is the Chinese are developing a taste for Western Beef, or anything Western, and here we are struggling to get the message across to people to adopt a more healthy Asian—diet. In reality, America is arguably progressing more in rediscovering the old ways and witnessing change and diversity than most. American’s are drinking more wine than ever, and yet the French are drink more spirits. Now there’s a paradox. Even more telling, America’s most comprehensive cookbook, ‘How to Cook Everything’ by the legendary Mark Bittman is full of Asian and Mediterranean dishes.